Brews and bacon draw the patrons into one Baltimore bar. 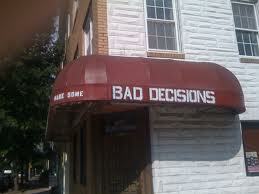 Bad Decisions hosts a monthly event named Beer & Bacon Happy Hour, according to AOL News . Patrons’ choices include a bacon-filled dinner menu, bacon-themed cocktails and bowls of bacon. Forget peanuts and pretzels. Drinkers get baskets of bacon on which to snack between brews. Owner John Reusing said the event draws dozens to his dive. “Some of my regulars factor Bacon Happy Hour into their monthly budgets, right next to rent and groceries. They take it very seriously,” he said to AOL News. Reusing figures he goes through 50 pounds of free Applewood smoked bacon each month. Another 40 pounds go towards the specialty bacon dishes and cocktails like the Habanero Pepper Mojita, a minty rum mojito with habanero peppers and bacon crumbles. As far as food goes, area chefs helped him come up with dishes such as grilled bacon kabobs, bacon shrimp and bacon cinnamon rolls.